"Could the ground lug/the x-2 RC filter on the line filter be used as the gathering point for the power/signal and chassis grounds, or is the chassis ground point a better option for that?" I've missread that, I thought you were using a external line filter. This case is best to ground gathering point at line filter. My exprience shows grounding to chassis causes noise very bad. 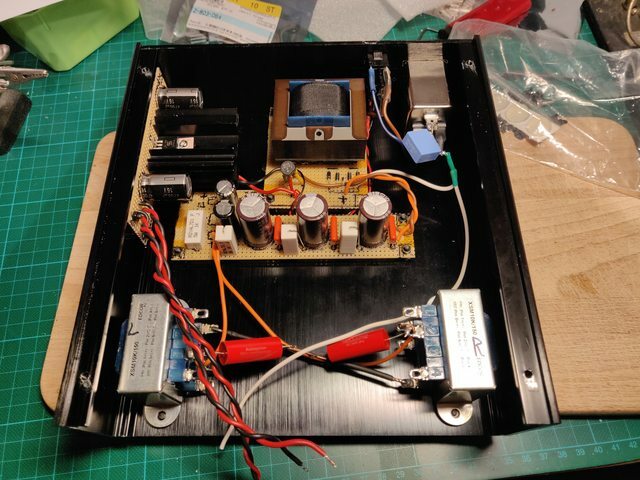 Hi, I have used the chassis as an EMI filter and earth ground many times and normally include a "ground" connection to allow connection to other gear (phonos, etc). I usually,(just to be sure that the ground terminal going to other gear is really a good one) attach a wire of 20 gauge or bigger between the IEC input filter ground/earth/chassis connection and the gear ground terminal. I also scrape off any finish and make sure the IEC filter case is making good contact with the chassis. I never connect the signal grounds to the chassis. It is quite frequently a cause of noise and potential ground loop based hum (particularly when attached to other gear). BTW, if you use a metal chassis cover be sure it makes good electrical contact with the chassis. Eternal transformer housings and such need it as well. I always separate the signal and earth grounds with an X2 capacitor and parallel resistor. One instance that has always bothered me is twist lock capacitor cans. They are usually mounted on an insulating wafer. The negative (ground) terminal is generally the can (I have seen some when it is not though). To comply with electrical codes any exposed metal parts need to be at earth ground. If you do that to the can then the signal and earth grounds will be the same causing noise etc. If you don't and have the can at signal ground then you will be in violation of the codes. This is one reason I don't use that type of capacitor. I managed to get the power supply part all wired up and mounted, grounds included. I found out that the line filter housing has a good connection to the back panel already, so I just scraped away the anodised layer from the other panels and made sure the continuity was good foor the entire case. I used the RC filter as the common point for the power and signal grounds. I'll trim and route the signal ground once I have the actual signal bit done. The output transformers have a solid copper wire between pin 8 on both to act as gathering point for all the signal grounds. 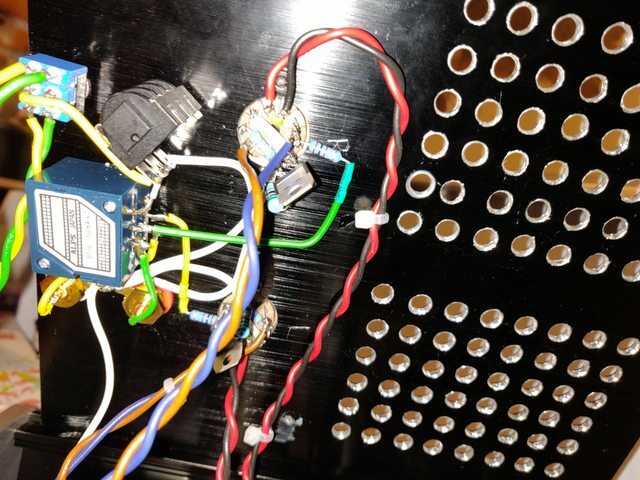 Can I just use pin 9 as a "ground" point on the socket and hook up the grid resistor and the ccs straight to that? Maybe even use it as the gathering point for the entire channel? This would let me hook up most things on the top panel and cut down the wiring I have to drop down to the body of the chassis quite a bit. 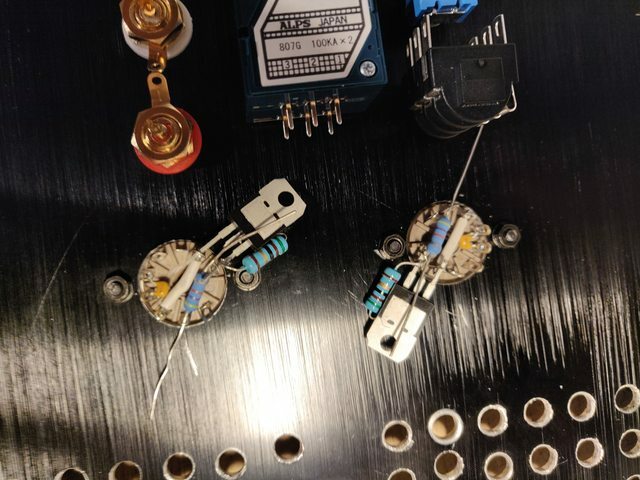 I would then have a "left ground", "right ground" and "output ground" meeting up on the copper wire bridging pin 8 on the output transformers, which is where the white wire to the X2-RC filter connects. I hope that made some sense? Hi, Pin 9 is an internal shield connection and can be used that way. In any case it ought to be grounded to the signal ground. Since the tubes are quite close together meaning left and right grounds are close to each other. I would recomend bridgeing the two pin 9 grounds together then have just one wire out from pot to gnd. in the middle of the ground birding wire of pin9s should be the gnd wire from pot. You want to bridge the grounds together as this is not a duall mono preamp with seperate left and right power supplys. The left and right grounds will have to always to meet each other again at somepoint and the longer the distance it travels the more proune to picking up noise. Hi, Yes that is fine, just watch that you don't marry up the separate grounds for each channel somewhere else as it can cause a ground loop and hum. They are rather insidious and are often not obvious. You would think that the more grounds the better, but it is not the case for audio. With the low gain of this particular circuit it is unlikely to cause any issues though. Oddly, it does work at RF frequencies where everything is going to ground planes. Then too at that frequency range hum is seldom a problem as the circuit won't respond to it or do anything with it. I finished wiring everything up tonight and much to my surprise, there's not a speck of hum, at least none I can perceive! B+ is a tad on the high side though. With R1 at 560R and R2 at 1kR, I still get around 157V B+ at the transformer pin. The 50R for the LM317 is a 51R one , as that's what I could get my hands on, if that might explain the ~10V excess. Should I just get some ~600R ones for R1, to see if that would drop it down, or should I swap out the ones at R2? About as clean as I could get it, with how things are mounted. Ok. I needed to try to make this one with the components in hand (Europe side). So I got some output transformers from Greece. Same spec as the Edcors and built toroidal. Will fit headphones up to and around 75ohms. I have 220 to 110volt transformers available. They are cheap i Sweden and commonly used when you have USA bought equipment. Rectified and smooted it will give you sort of 155volts. 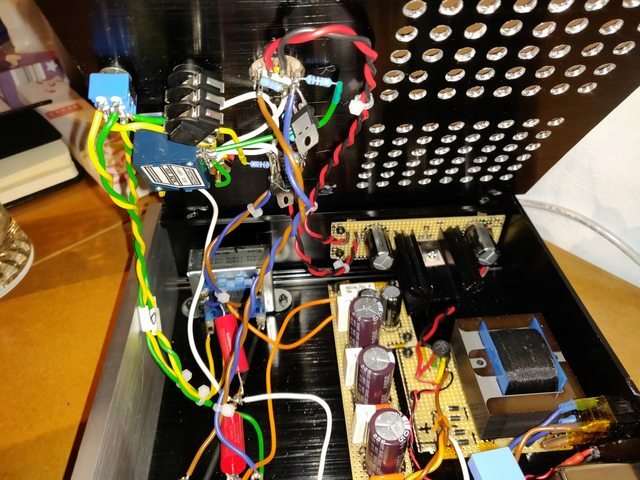 Sins I use this external transformer I also use an external 9-30V dc transformer to connect to heaters through a voltage regulator. What I have in hand is 9V 500mA but many will do the job. 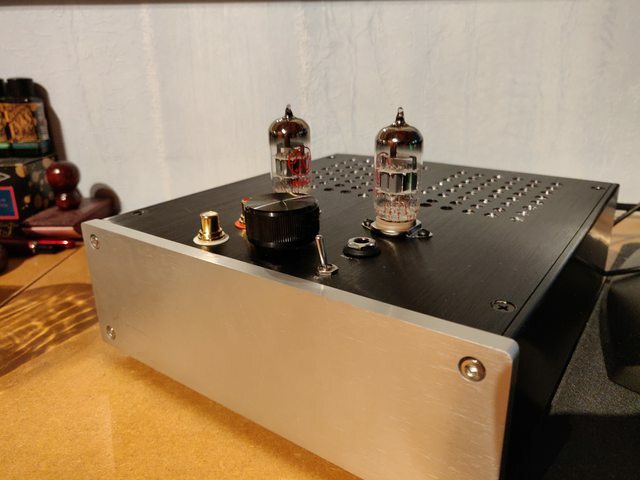 This gives me oportunity to build an old style powersupply with rectifiers caps and a 2H Hammond coil that I have left-over. I etched the board yesterday and powered the powersupply up and it seems to work 157volts unloaded but will not go down with this construction. And the Dc-heaters vill be padded down to 6volts. I will have this construction in a case with common conectors for the powersupply transformers. So I can change them to what ever is in hand. I will post some pictures soon. JJ Valves aren't that good in sound quality typically quite hard, you should be able to easly upgrade them with some NOS ones on ebay for cheap. So I got some output transformers from Greece. Same spec as the Edcors and built toroidal. Will fit headphones up to and around 75ohms. Could you please tell where you got these?